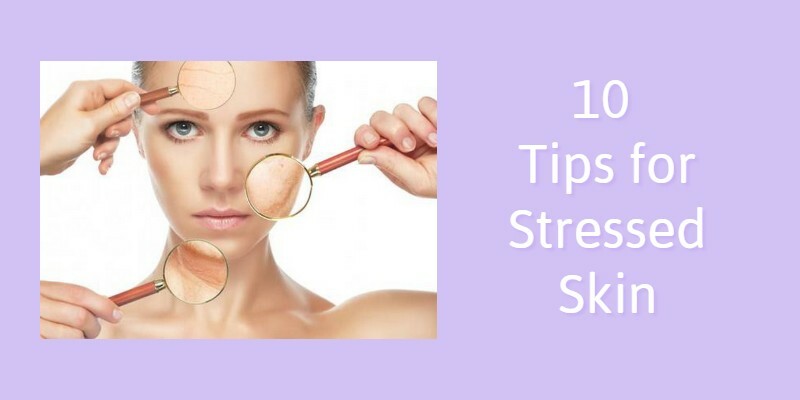 When we get stressed, we can’t avoid the signs of stressed out skin. With our hectic schedules and busy lifestyles it is impossible to avoid stress completely. No matter how busy you are…your skin can still look amazing! You can still achieve your goals and make sure your crazy lifestyle doesn’t show up in your skin. Here are 10 helpful tips to help keep your stress from showing up on your face. Never neglect your skin, no matter how tired, unwell or stressed you feel, always make sure you remove all traces of make-up before you go to bed. Even a walk around the block will help. Exercise is good for your skin because it increases blood flow and nourishes skin cells by providing oxygen. Regular exfoliating equals silky smooth skin. Exfoliating removes all dry/dead skin cells on the surface of your skin and is one of the most important steps in a good skincare routine. 5 extra minutes in the shower, twice a week, is all it takes to achieve healthy, glowing skin. Draw a bath and put on a face mask… even if you only have 20 minutes once a week. Using regular face masks will provide your skin numerous beauty benefits. Facemasks are the perfect skin care treatment to help your with your skin care concerns. Treat yourself and your skin to regular facials, no matter how busy you are, your skin needs a regular routine. Your beauty therapist will be able to help correct any problems your skin might be showing during routine facials. It is important to practice good eating habits as your diet does affect your complexion. If you eat a poor diet… your skin will definitely suffer. Eat more Brazil nuts. Studies suggest that a selenium-rich diet can help to protect against skin cancer, sun damage and age spots as well as reduce total cholesterol and LDL cholesterol and help Thyroid function. In fact, 5-6 Brazil nuts a day will provide your recommended daily allowance of selenium. If you’re going to take up one new habit this year, make it green tea. It not only hydrates like water, but it’s loaded with antioxidants and nutrients that have powerful effects on the body. Drinking green tea helps fight skin cancer by promoting DNA repair. Seven to eight hours each night is ideal. Even though you have lots to do don’t rob your sleep time… during sleep your body boosts blood flow to the skin while you snooze, which means you will wake to a healthy glow. Drink plenty of water. During stressful times you might crave wine, soft drink or even caffeine but drink water its your skin’s best friend.